According to Thai officials, a man thought to be Iranian has had both legs blown off after attempting to throw a bomb at police in the country’s capital Bangkok. 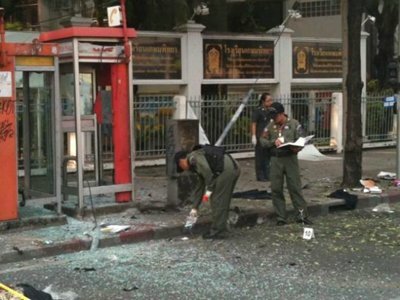 Two other explosions were reported in the same busy commercial district of Bangkok, injuring four other people. Police said one blast took place at the house the injured man rented with other Iranians. One of those men also threw a bomb at a taxi in the capital. Last month, the US embassy warned of possible attacks in Bangkok. The warning over possible attacks last month was of attacks perhaps against Israeli and American interests, and a man has been arrested in connection with those and some materials were found. The Bangkok blasts come just a day after two bomb attacks targeted Israeli diplomats in India and Georgia. Israel has accused Iran and Lebanon’s Hezbollah of orchestrating the attacks. Iran denied the allegations. There is no sign of who the attackers in Bangkok might have been targeting, but the timing and the link to Iran will raise suspicions that this might be part of a coordinated campaign. Israel’s press says the attacks on embassy staff in India and Georgia raised fears they were the start of a wave of attacks on Israeli targets. On Tuesday, Israeli defense minister Ehud Barak accused Iran of being behind the Bangkok blast, the AP news agency reports. The explosion “proves once again that Iran and its proxies continue to perpetrate terror”, he is quoted as saying. He said Iran and its Lebanese ally Hezbollah were “unrelenting terror elements endangering the stability of the region and endangering the stability of the world”. Ehud Barak is on an official visit in Singapore. A statement issued by the Israeli defense ministry noted that Barak was in Bangkok on Sunday, AP reports. Police said the first explosion happened around 14:20, local time, at a house in the Ekamai area in central Bangkok, which the three Iranians were believed to have rented for a month. Two men managed to escape the explosion that severely damaged the house, according to police, but a third man who suffered minor injuries tried to hail a taxi. When the taxi refused to stop for him, he threw at least one bomb at it. There was a third explosion when the same man then attempted to throw another bomb at police, but missed. The man lost his legs when the device blew up. He is said to be receiving emergency treatment in hospital. Thai media said that an identity card found nearby indicated the man could be of Iranian origin. A police forensics team was examining the house and reports said that police used a high pressure water cannon to defuse another explosive found there. The Thai authorities say they have detained an Iranian man at Bangkok’s Airport for questioning, but it was not immediately clear if he was one of the two other suspects. Thai Prime Minister Yingluck Shinawatra urged the public to remain calm. On Monday, an Israeli diplomat was injured in a car bomb attack in the Indian capital, Delhi. It seems a motorcycle rider came from behind and attached an explosive device to the back door of the diplomat’s car. At almost the same time, a bomb beneath an Israeli diplomat’s car in Tbilisi, Georgia, was found and defused.